The PowerScan™ 8300 series of laser scanners are Datalogic Scanning's premium line of rugged industrial handheld data collection products for linear codes. 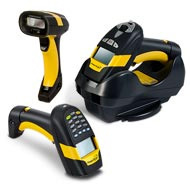 The PowerScan™ 8300 series of laser scanners are Datalogic Scanning's premium line of rugged industrial handheld data collection products for linear codes. The PowerScan PBT8300 laser scanner features the standard Bluetooth® wireless technology combined with the outstanding reliability and reading performance found in PowerScan products. Based on the Bluetooth 2.0 standard, the PowerScan PBT8300 scanner is easily configured to be compliant with Class 1 or Class 2 requirements, according to the mobility range desired, allowing for distances that exceed 90 m / 295 ft in open air. Connectivity is implemented through the receiving base station, which communicates to the host through a choice of interfaces (Serial, USB, Keyboard Wedge or Wand Emulation), or by connecting the scanner directly to any commercial or embedded Bluetooth® compliant device. The PowerScan PBT8300 scanner mounted on a forklift with a Vehicle Mount Terminal (VMT) provides an excellent solution for warehouse applications. The PowerScan PBT8300 is available in three different models: A basic cordless model (PBT8300); an intermediate model with a display and 3-key keypad (PBT8300-D); and the advanced model (PBT8300-DK) which features a display and a full 16-key alphanumeric keyboard. The PBT8300-DK model additionally includes an embedded code-quantity application, for use in inventory, picking or receiving applications. All PowerScan PBT8300 models are available with reading optics for Standard Range (SR) or Auto Range (AR) for reading distances up to 12.5 m / 41.0 ft). PowerScan bar code readers are the ultimate industrial handheld devices, designed and constructed to withstand the toughest environmental conditions in demanding applications, offering lasting performance and outstanding reliability combined with exceptional reading performance and accuracy.